I am posting information gleaned from land records in the areas where our family’s ancestors resided. You can read more about this project in the overview . This group pertain to Papa’s Fellows ancestors who resided in Newaygo County, Michigan. Section 24 is just south of section 13, where Erastus Fellows purchased land on 14 July 1859. This deed is for one portion of the land eventually owned by Henry H. Fellows in Ashland Township. To clarify, this Henry H. Fellows, ca 1839-1915 was brother of Erastus G. Fellows. Another Henry H. Fellows, 1858-1905, was a son of Erastus G. Fellows, and a nephew of the older Henry. The younger Henry was Papa’s great-grandfather. Much research on both men named Henry H. Fellows was needed to determine their relationship to each other and the balance of the Fellows family. 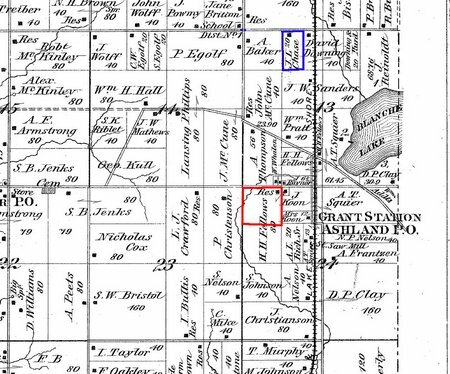 In this illustration, which I created by using the 1880 Newaygo County Atlas1, you can see the portion of Section 24 purchased on this deed. 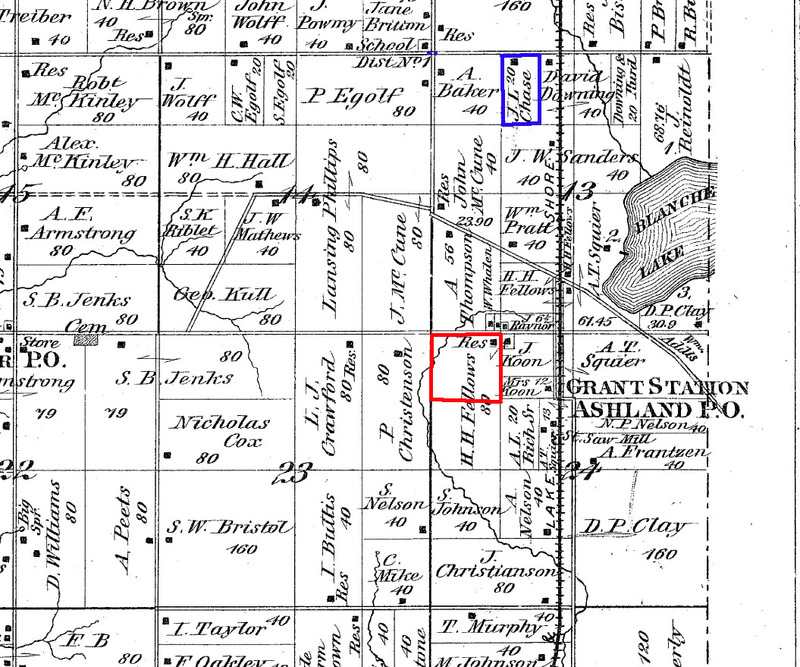 The land outlined in Blue is that which Erastus G. purchased in 1861. C. O. Titus, Atlas of Newaygo County, Michigan / compiled and drawn for the publisher by E. L. Hayes ; H. H. Avery, assistant, W. B. Patterson, assistant. (Philadelphia, PA : C.O. Titus c1880), page 41, The University of Michigan. Michigan County Histories and Atlases. http://name.umdl.umich.edu/3927793.0001.001 : accessed 15 February 2010.